Black Friday may be over, but your holiday shopping probably isn't. 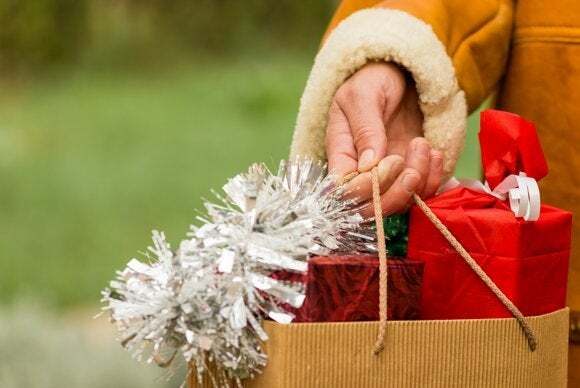 Unfortunately, most shopping apps focus on deals and sales, not your holiday shopping strategy (unless your strategy is just "buy things on sale," which is actually a pretty good strategy). Ready to level up your shopping skills? Here are five free apps that can help—these apps don't just bring deals, they help you plan and execute your shopping spree while also helping you maximize your savings from every angle. We have an app that lets you track prices (both online and offline), an app that lets you browse weekly ad circulars, and app that lets you clip electronic coupons, an app that helps you choose which credit card to use, and an app that gets you extra savings at Target. Ready to go shopping? Make sure you have these five free apps on your phone before you hit the mall. ShopSavvy tells you where you can get the best deal on a specific item. You know what you want to buy, but should you buy it at Target, Best Buy, or will you find it cheaper online? ShopSavvy (free), a comparison app with a built-in barcode reader, can help you find what you're looking for at the right price. ShopSavvy is the perfect app for people who plan ahead, because it lets you track product prices and will alert you when a product goes on sale. The barcode scanner brings up detailed product info, online reviews, and prices in both online and offline (nearby) stores. That way, even if you don't want to buy the product online, you'll know if you're getting it for a good price—or if there's a better price nearby. In my tests, ShopSavvy and another popular barcode scanning app, RedLaser, found similar online prices, but ShopSavvy found better physical-store prices. 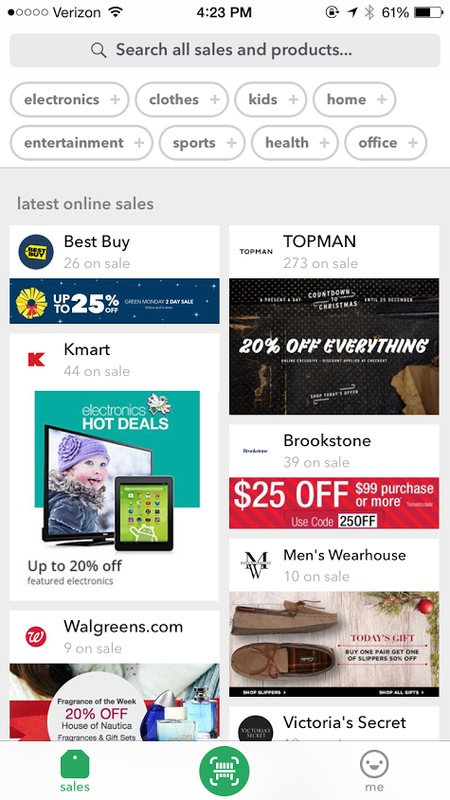 ShopSavvy's main screen shows sales—it's not a coupon app, but it does show products on sale at various stores. If you see a product you like, you can save it to a list for later or set up an alert to track the product's price. The app will let you know if the product goes on sale at a later date, or if it undergoes a price drop at a retail outlet. This isn't the most full-featured shopping app—you'll still need to consult other apps for coupons—but it is a great barcode scanner and price tracker. If you know what you want to buy, ShopSavvy will help you figure out exactly when and where to buy it. Since holiday sales are frequent but short-lived, this is exactly the app you need to aid you in your shopping. I don't know about you, but weekly ads from stores like Target, CVS, and Best Buy rarely make it into my apartment—there's a trashcan next to my mailbox for a reason. But weekly ads can be pretty useful, especially around the holidays, alerting you to sales you never would have known existed. If only there was a way to peruse relevant weekly ads without having to succumb to junk mail crossing my threshold. 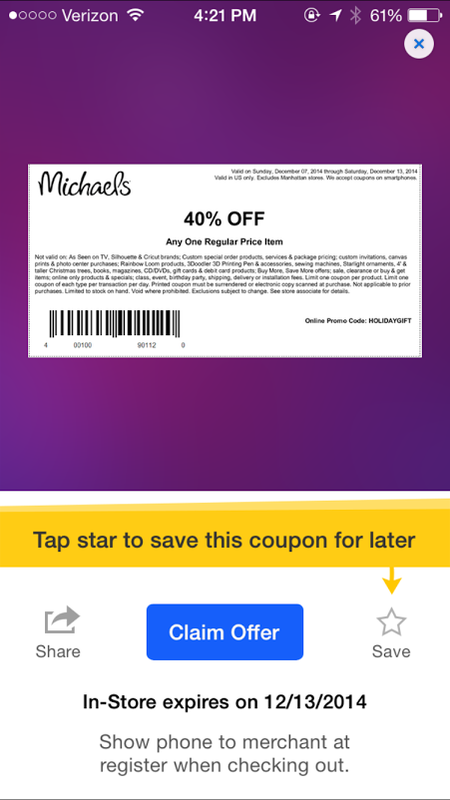 Shopular gives you digital versions of your local coupon circulars. Oh wait, there is: Shopular (free), an app that aggregates weekly ad circulars (along with individual deals and coupons). Shopular offers coupons and one-off deals, but it's not really a coupon app—instead, it's an app that shows you all of your local weekly ads right on your iPhone. If you shop at stores like Target, GameStop, Petco, Walmart, JCPenney, Walgreens, Kohl's, Jo-Ann Fabrics, Staples, Rite Aid, Big Lots, RadioShack, or Sports Authority, you'll definitely want to check this app out. The app lets you swipe through digital versions of the circulars, save individual pages, and share deals with friends. It's convenient because you don't have to worry about losing a physical ad (or forgetting it at home) while you're shopping. Shopular also highlights individual deals on its "All Deals" screen. This way, you don't really have to read through the circular to find deals that are relevant to you—for example, my Shopular tells me that Target is having a buy-one-get-one-50-percent-off deal on toys. 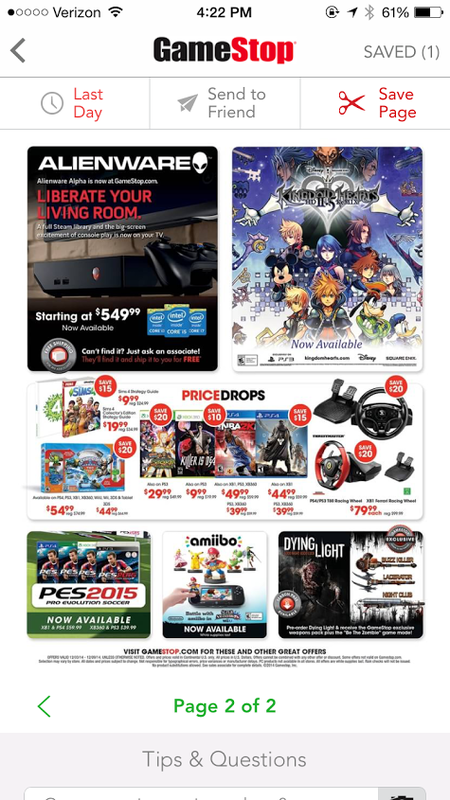 While I would've found this if I'd read through Target's full circular, it's nice to be able to see it at a quick glance. The app does let you pick favorite stores—you'll still see some circulars from non-favorites, but your favorites list dictates what types of one-off offers you'll see. All smart online shoppers know about RetailMeNot, the coupon site that aggregates reader-submitted promo codes for online retailers so you (almost) never have to pay full price when you're shopping online. Well, RetailMeNot (free) also has an app, which aggregates online and offline coupons, so you can save money in brick-and-mortar stores even if you're not handy with a pair of scissors. Retail Me Not: Like coupons, but smarter. 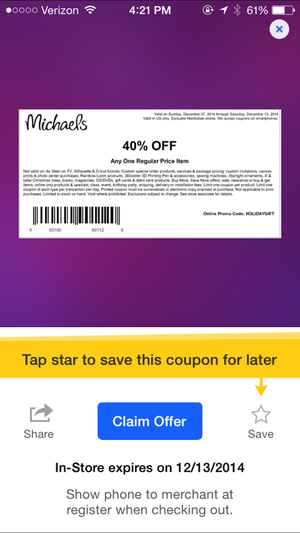 RetailMeNot's app is a nice coupon alternative for real-life shoppers, because it lets you "clip" coupons and scan them right on your phone. The app's coupons are labeled "in-store" and "online," so you know which ones you can use while you're out shopping, and which ones you'll have to save for later. Unlike other coupon apps, RetailMeNot organizes its coupons and deals in multiple ways—by popularity, by location, or by your preferences—so you can quickly find what you're looking for. Tap on any coupon in the app to see more details, such as rules and restrictions and terms and conditions. From the details screen, you'll be able to "clip" the coupon (if it's an in-store coupon) and show it to the cashier, who will then scan it from your phone. You can also "star" the coupon (add it to your favorites list for later), or share it with a friend via text, email, Facebook, or Twitter. Tap "Find Nearby Locations" to find nearby stores that accept the coupon, or click "See More ____ Offers" to see more coupons from that retailer. In true RetailMeNot fashion, you can also report the coupon as being no longer valid or unusable (some stores don't accept coupons that haven't been printed out). RetailMeNot makes finding real-life in-store coupons as easy as typing "(enter favorite store here) promo code" into Google. I have two words on why it’s often better to opt for credit instead of cash: rewards points! Many credit cards (and some debit cards) give you points, cash back, and other rewards simply for showing up, and Wallaby (free) can help you maximize those point systems so you'll have a nice-sized reward stash waiting for you in January. Maximize your credit card rewards with Wallaby. Wallaby is an app that tracks your credit cards and their rewards so you don't have to. Just tell it which cards you carry (American Express, Visa, MasterCard, Discover, and JCB cards are accepted), and Wallaby will track which cards give you the most reward bang-for-your-buck at various stores and restaurants. The app's main screen features a map of nearby retail locations, with a recommended card for each place. Wallaby is handy if you carry multiple rewards cards with rotating categories. For example, my Chase Freedom card gives me 1-percent cash back on all purchases, and 5-percent cash back on three categories, which change every quarter. Wallaby knows which categories are currently "active," and will make sure I don't accidentally use a different card when I'm shopping at a store in an active category. I like Wallaby because it's one of very few financial apps that don't require personal info, such as a linked bank account. However, you can offer up personal info if you want more detailed and thorough tracking—link your credit card accounts to the app, and Wallaby will track how much you spend in each category. 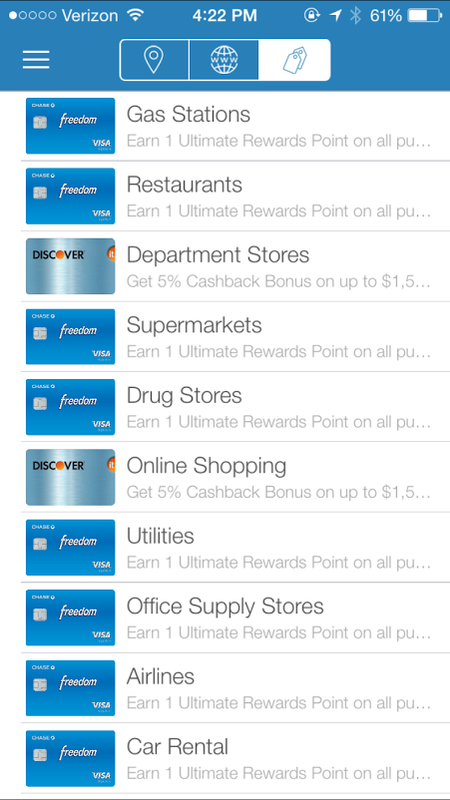 If my Chase Freedom card only gives me 5-percent cash back in gas stations up to $1500, Wallaby can warn me to switch to my Discover It card when I've reached that cap. The app also has a feature called "WalletBoost," which is a service that recommends credit cards based on your spending habits and preferences. Who can resist the lure of Target's red-and-white big-boxiness? Nobody, that's who. 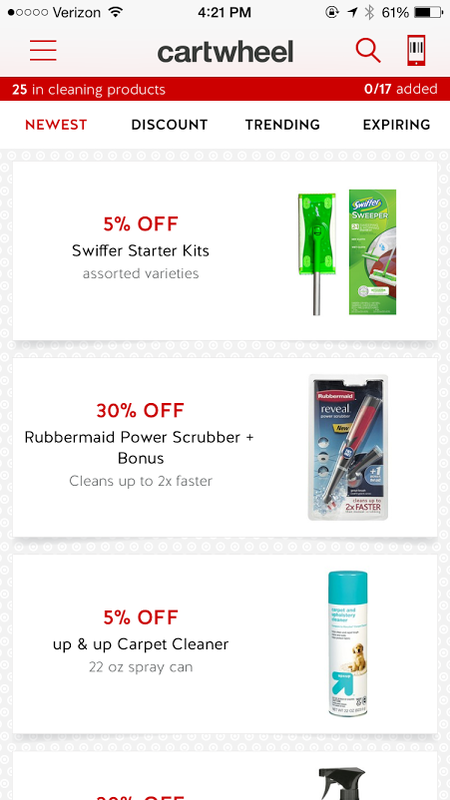 If you do any of your holiday shopping at Target this year, you'll definitely want to download Cartwheel (free), which will save you even more money. Wait... a coupon app, just for Target? Count me in! 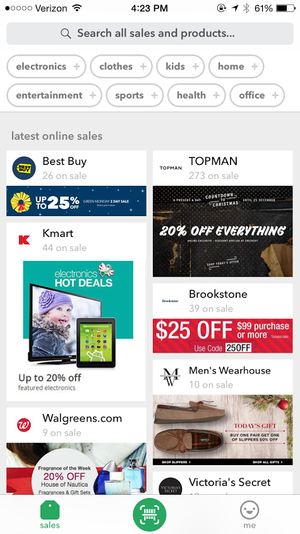 Cartwheel is Target's opt-in coupon app—it offers extra discounts on various products, usually 5- to 10-percent. To get your discount, you have to use the app, so this discount can be used on top of any other sales or coupons that Target is running. Here's how it works: Find products on sale in the Cartwheel app, either by searching, browsing, or scanning the product. You can search for the product by name, browse for the product by category (e.g. "cleaning supplies" or "toys"), or you can simply scan the product's barcode with the app's built-in barcode reader. Once you find the product, add it to your Cartwheel account by tapping "Add." First-time Cartwheel users will be able to add ten offers per purchase, but you can also unlock "Cartwheel badges" to get more slots. Each badge gets you an extra slot, and can be earned by using the app (for example, the "Benjamin" badge is unlocked when you save over $100 with Cartwheel) and by connecting social media accounts. Once you've added all the offers you want, tap "My Barcode." This is your personal barcode, which will be scanned by a Target associate to apply your discounts. The app keeps track of how much you save through the Cartwheel app, so you'll know if it's worth your while. Not a Target shopper? Look for your local grocery store or drug store on the App Store—many have apps that feature exclusive coupons and savings.